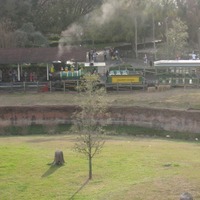 The Nairobi Train Station of the Serengeti Express Railway of Busch Gardens Tampa, a theme park located in Tampa, Florida, in 2010. The park opened as a hospitality facility for Anheuser-Busch Companies, Inc. on March 31, 1959. Busch Gardens originally hosted a brewery with beer tastings, but it was closed in 1995 and the roller coaster Gwazi was constructed in its place. In 1965, Serengeti Plains, inhabited by African wildlife, opened. In 1971, the Serengeti Express Railway, a two-mile railroad surrounding the park, was opened. The Stanleyville section opened, including the Stanley Falls Flume in 1973. In 1976, the Congo area opened, featuring Busch Gardens' first roller coaster, Python. Various theme areas and attractions have been added to the park over the years. The Edge of Africa was opened in 1997. Original color digital images by Ray Cepero, March 10, 2010: Private Collection of Ray Cepero. Digital reproduction of original color digital images by Ray Cepero, March 10, 2010. Cepero, Ray. 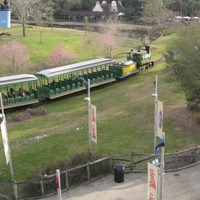 “Nairobi Train Station of the Serengeti Express Railway at Busch Gardens Tampa, 2010.” RICHES of Central Florida accessed April 23, 2019, https://richesmi.cah.ucf.edu/omeka/items/show/4465.